At Delta Upsilon Alberta we are on a mission to build better men. That means we want go-getters, challenge seekers, and people who aren't afraid to break out of their comfort zones. If you're the kind of guy who’s looking to make the absolute most of his college experience, this is the place for you. Since we're the only fraternity on campus committed to non-secrecy we can tell you straight out our four year plan for building you into a better man (all while having a blast). University is like a crash course into the adult world with harder classes piled on top. All of a sudden you start getting asked about what you want to do with your life and you don’t seem to have a genuine answer. And that’s okay, it’s not your fault. Nobody has a clue what’s going on or what they want to do in their first year. It’s a time of self discovery as you search to find out who you really are. 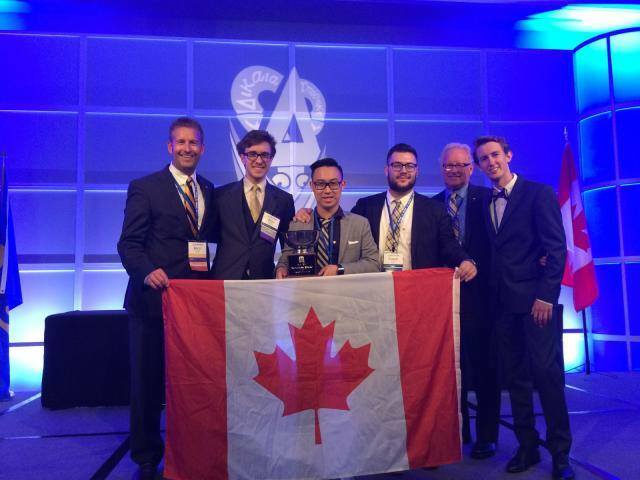 The Alberta chapter at DU's International Leadership Institute accepting an award for placing amongst the top in North America and #1 in Canada - a title we've held for more than five years! Our purpose as a fraternity is to help you figure that out. Like any successful leader will tell you, we believe that mentorship is the key to building better men. Over the course of four years at DU, you’ll be exposed to countless leadership positions, volunteer opportunities and different kinds of people that will make you to challenge your views and push yourself out of your comfort zone. You’ll have access to the wisdom and life advice of senior undergrads and influential alumni who were in your shoes only a few short years ago. You’ll have subsidized opportunities to travel abroad for leadership conferences to collaborate with brothers from across the continent. But most of all, you’ll have a house of twenty guys who will always have your back as you figure out the crazy journey to adulthood together. No matter what you want to achieve or who you want to become, DU can help make it a reality. Helping out a great cause with some great ladies at the Boys and Girls Club of Edmonton! As the only non-secret fraternity at the University of Alberta, everything we do is open and transparent to the public. You can ask us any question about our chapter and its workings and our budget is fully transparent so you’ll know exactly what you’re paying for. If you’re worried about hazing, have no fear since our initiations are open to the public as well as available to view on the internet so you’ll know exactly what you’re signing up for. Our commitment to non-secrecy coupled with our strong belief in meritocracy and inclusivity ensures that our membership remains a group of well-rounded and down to earth guys. In practicing justice, we seek to help those in need in both our local community and beyond. Recently we’ve been involved with organisations such as the Canadian Legion, Relay for Life, Purpose Collective and Big Brothers/Big Sisters of Edmonton. Internationally, our fraternity regularly sends delegates to join the Global Service Initiative to help build schools in third world countries.We do this all because we truly believe that in order to build yourself up, you must build up those around you. Being part of Delta Upsilon guarantees that you will have a unique and memorable college experience full of many different types of experiences. From wine tastings to sushi outings, and hockey games to foreign films, we believe that variety is the spice of life and regularly challenge ourselves to step out of our comfort zones. Come expand your palate with us on one of our monthly DUDEs (DU Dining Experiences), work on your public speaking at our semesterly roasts or learn how to impress the ladies with some sick salsa moves - you're guaranteed to get out of your comfort zone when you join DU! We also place strong importance on academic performance - after all, that’s the reason we’re all here isn’t it? And we don’t just talk the talk; our guys have upheld the title for having the highest GPA of all fraternities on campus for a few years running now. DUs also have a significant academic advantage with access to textbook libraries, numerous internal scholarship opportunities, chapter study hours (to keep you sane through finals week) as well as having 24/7 access to a great campus study spot that always has comfy chairs and good company. If any of you reading this have a sibling you’re close to, you know all too well that it's a unique type of relationship. They’re the ones who you who you can talk to about anything and who you’ve gotten into trouble with since you were kids. They’re a teammate that always has your back through all of life’s ups and downs. These are the kinds of friendships you’ll make when you join a fraternity. Not the short - lived kind between people you share notes with in class or group project members but rather ones that will last a lifetime. These are the kind of guys that you can call at four in the morning, that you’ll share a few drinks and countless laughs with, that will pull the all-nighter with you during finals week and the ones that will ultimately help you survive college. Through good times and bad, we’ve always got each others’ backs. Just like family. "My experience in DU has been a perfect complement to my business degree at the U of A. Alumni and older fraternity members who are further ahead in their degrees, offer mentorship and have provided me with the path I needed to take to be successful. Overall, DU has benefited my university education in so many different ways. Having access to an amazing house just off of campus is perfect for studying and hosting social events for my business cohort. To add to this, DU leadership conferences across North America allow me to make connections with DUs throughout the continent and allow me to expand my skills that I can apply later in my career." "The best part of joining Delta Upsilon however might be the relationships you make with ambitious young people. These relationships open the door to many opportunities and lead to a powerful support system. After 3 year of undergrad and 2 years at DU, I was lucky enough to get into medical school here at the U of A. Looking back on the journey I took its not hard to see how DU has helped me. It provided me with a support group of people encouraging academic success, multiple leadership opportunities I could write about, social skills that helped me ace my interview, and a powerful reference letter from a DU alumni." "When I transferred to the U of A, I knew I wanted to get out of my shell and become more involved on my new campus. Within a few short years DU had pushed me to take leadership roles in my chapter and my campus, infinitely more confident, and ready to be a leader in my community. Joining DU was a turning point in my collegiate career - I can’t possibly explain just how much the chapter did for me. Now, graduated, my DU brothers are still my closest friends. I’ve visited and kept in touch with DUs from chapters all over North America, young and old, who I see as fantastic mentors, close confidants, and lifelong brothers. Make no mistake- you get out what you put in, but joining DU has the potential to be one of the greatest decisions you can ever make. Dikaia Upotheke!" Hey! I'm Hunter and I'm the Vice President of Recruitment for Delta Upsilon Alberta chapter. To get to know a bit of who I am, I am big into freestyle skiing and have a passion for everything outdoors. I’m going into my second year at the University of Alberta and my first year studying business. Rushing a fraternity is something that is still very clear in my memory. Joining a fraternity had been something I had always wanted to do; for me it was just deciding the right one. It can definitely seem a little overwhelming meeting so many people in such a short amount of time. Thankfully, this page on our website here can help you understand this process that may be interested in! Keeping true to DU's founding philosophy of non-secrecy, I'm committed to making your transition to Greek Life as transparent as possible and to showing you exactly how you can build yourself into a better man while still having a blast with us at DU Alberta. I’m always down to meet new people, so drop me a line if you have any questions or want to learn more about what makes DU the place for you! Hola amigos! My name is Jeff and I’m the Recruitment Director for Delta Upsilon Alberta. To tell you a bit about myself, I am going into my fourth year at the University of Alberta, studying immunology and infection under the faculty of science. I spend my free time golfing, ski-ing, and skateboarding. When I first came to university, I knew that I wanted to join a fraternity, but I had no idea which one to pick. As soon as I walked into the Red Brick Mansion (our house), I knew that this was the only place I could be.The amount of friends, inside jokes and crazy stories I have after only two years will last a lifetime. So if this interests you, send me a message and we we can talk a little more about Greek life!